Discussion in 'General Plant Topics' started by creighton, Feb 28, 2008. Lighting: 2 X 55watt 6700K AH supply bright kit on for 10 hours a day. 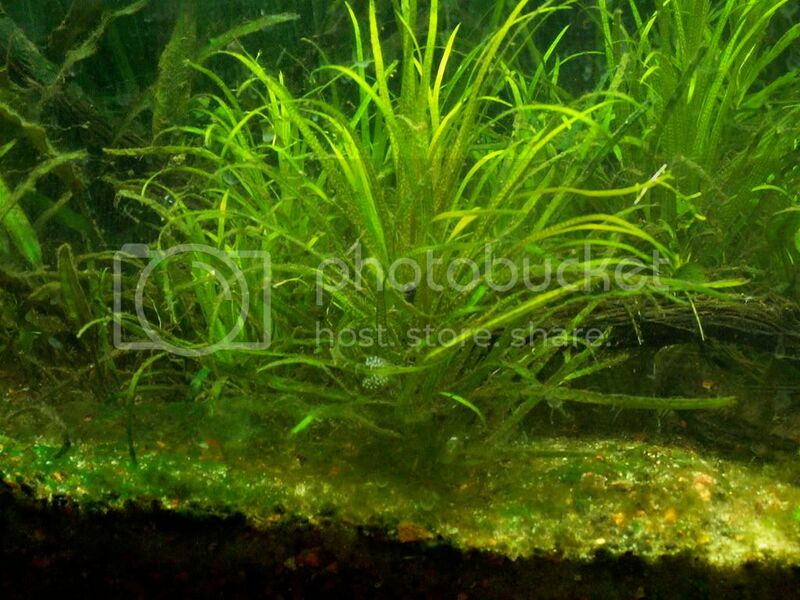 Flora:Blyxa Japonica, P. Gayi, P. Stellatus (sp), Rotola Green, Blyxa Aubertii, Val. nana, and a little hairgrass, glosso, and a little riccia. I've had problems with this tank for a while. I have not been able to figue out whats wrong. I finally broke down and bought a 4L bottle of excel. I think it could be a good scape, but with all all the algae it looks terrible. I'm sure its a CO2 or flow problem somehow. I just recently added the a little in tank filter to increase flow. But I think the flow is mainly lacking in the bottom of the tank and I'm not sure what to do to increase it. I only know EI, so other than dosing KNO3 and KH2PO4 with TMG, I'm clueless about how you are going about getting your ppms mentioned above. For a 30G tank, I would probably start out with 1/4 tsp KNO3 and 1/16 tsp KH2PO4 4 times per week and 15 ml TMG (TPN) on the off days 3 times per week. You don't like Otos, or what? A couple of Otos would have that diatom algae long gone ... it is candy for them. I would also get a few SAEs (true ones, if at all possible -- I just took some false SAEs (flying foxes) back to the LFS because they were mean). SAEs will eat a lot of the other algae. I would recommend some cherry or amano shrimp, but they have a problem with Excel, so don't waste your money if you plan on continuing with Excel. And, I personally would get some Nerite snails (at least 12 -- I have 20 in my 50G), they are algae fiends. I know all of these algae eaters may not be necessary if everything is perfect, but it sure makes life easier. Others know far more but here's my 2 cents based on experience. You could test your whether it is a flow issue my moving your DC around to see if its the same color throughout the tank. Is your CO2 consistent? I started have some algae problems, when I started travelling for work and CO2 ran out while I was away. 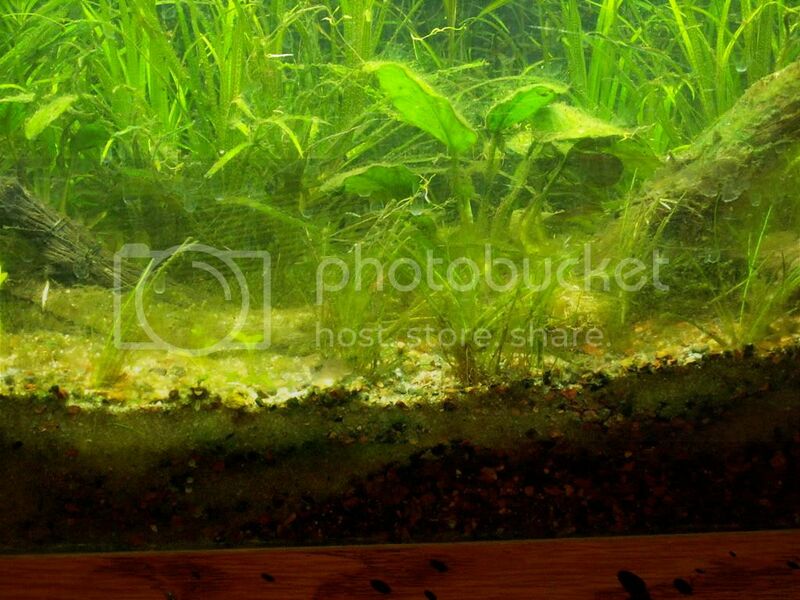 Are you stirring alot of stuff up when doing water changes or planting, the other way I have caused algae in my tank was replanting a whole bunch of stem plants. Tom's advice regarding water changes while planting or major pruning is something I always follow now. I'd pull the val nana (or sacrifice it) and treat aggressively with excel and scrape and clean as throughly as possible and do at least a 50% water change along with it. You have a lot of light especially using AH supply over your 30 gallon. You could go for a midday burst of a few hours at the 110W and then run 55W for the majority of the photoperiod. For your fertilizing is the NKP your target levels or what you are actually fertilizing. For target levels I think you are fine. 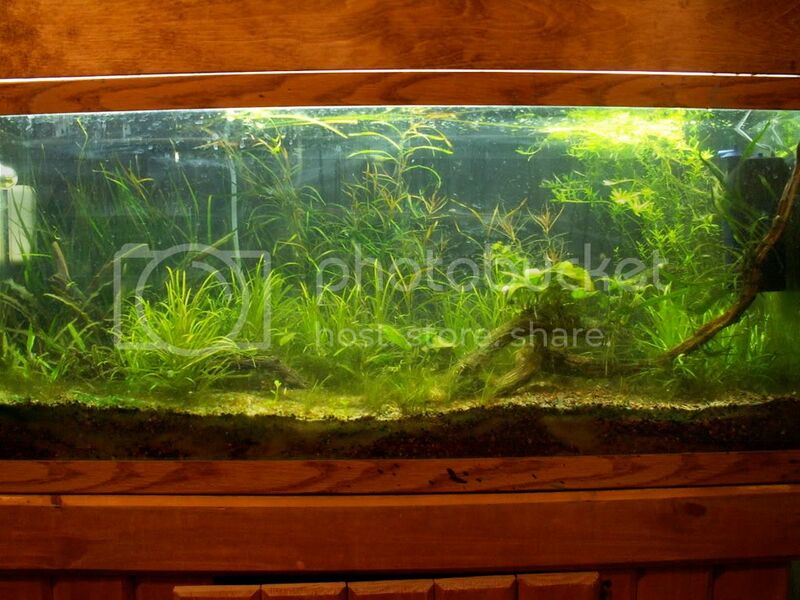 Based on your specs once you get the algae problem fixed your tank should look great. I added 6 amano's yesterday...I think there all dead. I found two but I haven't seen the others. I took them out of a colder (70ish degree) tank and just put them into 80 degree water. I thought they would be fine because they're pretty rowdy shrimp, but alas I think there all dead. Witch will contribute to my algae problem because I can't find their corpses . I have some otto cats in another tank that I will move to this tank, but the bioload is getting pretty high. I guess I'll put 5 in...do you think that will be enough? As far as SAE's I don't think I will be able to obtain them locally. I have some red cherries but they will become food for the apisto's I think, but I may try just to see. Where can I get Nerite snails? I've always heard they were great, but I've never know were to get them? My fert routine consists of 4 X 7L drinking water dispensers each with a different nutrient i.e. one for N , P , K , and Trace. I use a graduated cylinder to add the appropriate ml to the tank to get the right ppm in that tank. I may be a little off on the amount of ml's I add, but its not too far off. Particularly for phosphate, I made the solution to concentrated (50g/L) so I only have to 6.4ml's to get 2ppm of P. So I may be a little over on that, but otherwise I think those are the correct dosages. I used Chuck's calculator a scale accurate to the gram to make the stock solutions. I went ahead and pulled the val, how should I treat with excel. I've been misting the plants when I do water changes , but I can't really tell the difference. Should I add daily or something? This is my first time really ever using excel, and I have to say I HATE how it smells. It always makes me sneeze when I mist the plants. Great idea with moving the drop checker around!!! I never thought of that. Also I'll give my filter a good rinsing this weekend and see if that won't increase the flow a bit. Thanks for all the input guys. I'll post some more links to pic to let you konw how it goes. Yes, my first name is Ted. My guess would be that Excel did your amanos in -- I've kept them at up to 83 degrees. For me, amanos are more sensitive than cherries and will die first. Shrimp are rather sensitive, so on major landscaping days when the substrate is stirred up, I do a water change per Tom's recommendation -- this water change is not just for shrimp, but for all of your fish and other critters. I think it is the shrimps' sensitivity to nitrates that bothers them with this. Again, if you will be using Excel, keep the shrimp in your other tank -- they do not like that stuff. You can tell if your shrimp are having a tough time because they will just sit in a corner (upper corner for me) and not eat. When they do that, I go for a water change and they usually start eating again immediately. Shrimp are sort of an early warning system. I would just put one oto in there for now ... no reason to take the chance of losing 5 of them. Mine are tough as hell, but you never know. I think that Apistos and cherries are compatible, but maybe you have babies or something. Somebody else should verify on that one -- otherwise, you can put just one in when you have time to keep an eye on him. But, not when you are dosing with Excel! 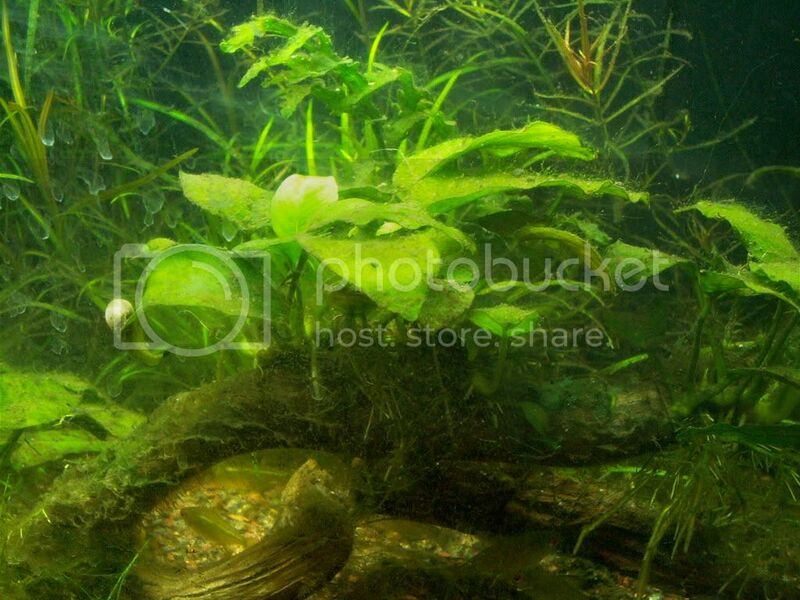 Not sure where you are located, but I bought my Nerites from AAG (Aquarium Plants, Pond Plants, Freshwater Aquarium Plant & Aquarium Accessories – Arizona Aquatic Gardens) in Arizona. Nerites cannot breed in fresh water (thankfully), but do deposit little white eggs here and there, which I'm sure some some folks do not like. Honestly, I haven't heard a lot of people talk about using Nerites here on this site. Until I learn this stuff better, I just need their algae eating skills. I just got a shipment of 6 SAEs (1 was DOA) today from AAG, and they are doing fine. I really didn't add that much excel only like 15ml or so but who knows. I'll go ahead and throw an otto in there and see what happens. I may have to wait on the snails...I'm broke as a joke . I'll clean my filter tonight. And by the way if you ever have a choice between a Marineland C-220 and a Fluval 205 pick the Fluval . I wish T-Barr would chime in and save me . Just kidding. Thanks for all the advice guys. Yeah, I hear you on being broke! This is an expensive hobby when you are just starting off. The snails are less than a buck a piece (minimum order 12), so I'll bet you can get 12 for under $25, but I can't know the shipping cost for sure. AAG could give you an estimate. I assume you do not live in my area (Los Angeles)...I'd happily give you 6 nerites. Mine are eating so much algae that I don't think there's enough for everybody else in my tank. One post said that a simple test for whether or not you have enough flow is if ALL of your plants are swaying. If some are standing still, you are probably lacking. If a C-220 has 220 gph, that's not too bad for a 30G tank, though many here would do more. With your extra filter going, I'm sure you're fine, as long as the flow isn't being blocked in too many places. I have some plants that really need to stay pruned in order for me to have enough flow. Cool. How do you like the ADA AS II? I'm thinking about switching substrates this summer when I'm out of school. Would you recommend ADA AS II? Are you going to try to go to Plantfest this summer? My plants love ADA AS II. The big problem I have is that because I'm a beginner, I keep changing my mind about what to plant where. ADA AS deteriorates into an almost mud-like texture ... you can imagine what a mess it can make when you are uprooting plants. Of course, I haven't had the best uprooting technique, I'm sure. Tom recently told me that twisting plants works well. So, overall, I would probably have been better off with something like Flourite, but it's not like you can't move plants around with ADA AS -- I've just been doing it too much, which leads to lots of water changes. Many would say that ADA AS is the best, but there are other very good options. Though I am going to Miami on a business trip in April, Plantfest can't happen for me this year -- I must admit it would be cool though. I wouldn't say it's because you are a beginner. We can all learn something...even the most "advanced" of us. I just got rid of this stuff in my 10 gal. I don't know if it the correct way but it worked for me. I quit adding diy co2 and went to low light went from 2x 20 watt bublbs to 1x 20 watt bulb. It took about 2 weeks and added 3 ammano shrimp also but never noticed them eating this stuff . The coment to use the peak midday peak might be good too. Unfortunately I can't turn one on light on at a time the way I wired my AH kit when I got it. Thanks, Creighton, I'll take the address and phone number with me and keep this in mind. I won't have much free time, but, I may be able to work something out. Okay...just got done with a 90% WC misted the plants with excel, then added 11mls to the tank and cleaned the filter. Which made NO difference in the flow of that crappy thing !!! I added one otto cat and 7 RCS. Hopefully they won't die. I also trimmed back some of the rotola green and planted the clippings. I have a pot of glosso and microsword waiting to be planted, but I have 3 tests this week so I may not get around to it. The B. Japonica is growing good, but the Needle leaf ludwigea is not doing so hot. A few stems were rotted just above the substrate. I think its due to poor circulation.